Center Stage has bigger dreams than our budget allows — like most arts and educational programs. If you’re interested in filling a material need, check out our wishlist. There are always things that we could use to make our program better and our jobs more efficient. – Send our participants to a show! 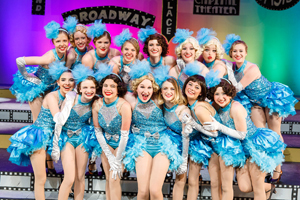 Whether it is a touring Broadway show or on at the local high school, we encourage our students to view, analyze and learn from other performers. And it’s just plain entertaining! – Send local elementary students to see our show! Money for field trips is getting smaller and smaller each year. For just $2 per student, you can sponsor a class or an entire school to attend our school matinees. – Provide tuition for a student in need! Every year we have students who would like to participate but don’t have the funding to do so. You could help them out. Although we do not provide full tuition trades to our students because we feel that they need to have some financial investment to be committed, we do provide a handful of tuition trades each year. Donations allow us to do more of these and still have the funding necessary to cover the production costs. – Provide our teachers with professional development opportunities! Our teachers are what make our program so successful. They give their heart and soul to the program, and we would love to look for ways to help inspire their creativity and continue their growth as an educator. There are several national programs that are available but the travel expenses make it hard for us to cover the costs. Your sponsorship can make those training opportunities a reality. If you are interested in sponsoring any of these projects or have another project to propose, drop us an email: lori@csyp.org.